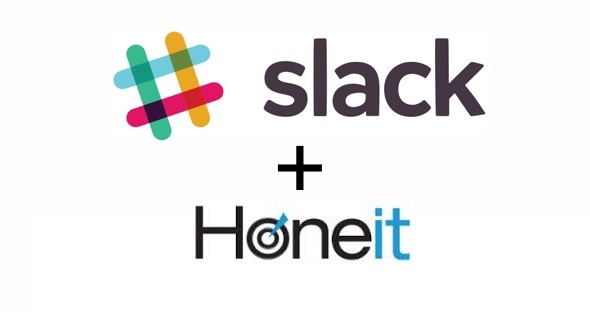 Based on feedback from Honeit users, we’re excited to announce our latest interview software integration, with Slack. 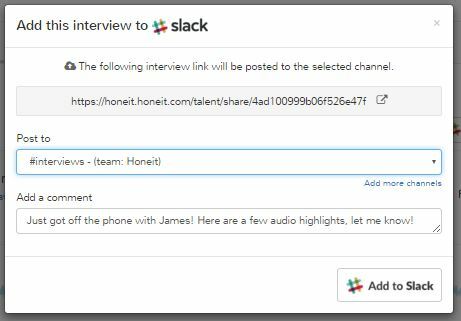 Recruiters can now easily share all the rich candidate data and phone interview insights with recruiting peers or multiple hiring teams, through the Honeit + Slack integration. The Honeit team uses Slack to effectively communicate, to “be less busy“, and to get stuff done. Just like many of our customers, we’ve experienced the benefits of real-time communication first hand, and we’re thrilled to bring Real-time Audio Interview Communication to Slack. After you hang up the phone, all of the rich audio excerpts, your interview notes, skill-stamps and the entire audio conversation, can be easily shared with fellow recruiters or hiring managers through public or private channels on Slack. As always, you have complete control of the interview data and candidate insights that you choose to share with your recruiting team or with hiring managers. We’ve been inspired by Slack and their commitment to building something companies can’t live without, but also something their customers didn’t know they needed. Stewart Butterfiled, Slack CEO, wrote this inspiring memo to early employees just before their Beta launch, reminding them that they weren’t selling just another group chat system, but that they “were selling organizational transformation”. For years, phone interviews have been an off-line experience and performed in a vacuum . We’re excited to bring real-time interview data and transparency to the hiring process, to improve the interview experience, accelerate collaboration and enable higher quality hires.